Once installed on the Meizu Pro 5 Ubuntu Edition smartphone that is equipped with a 5.7 inch full HD AMOLED display and powered by a Samsung Exynos 7420 octa-core processor supported by 3 GB of RAM together with 32 GB of internal storage. Check out the video below to see the connection process in action. 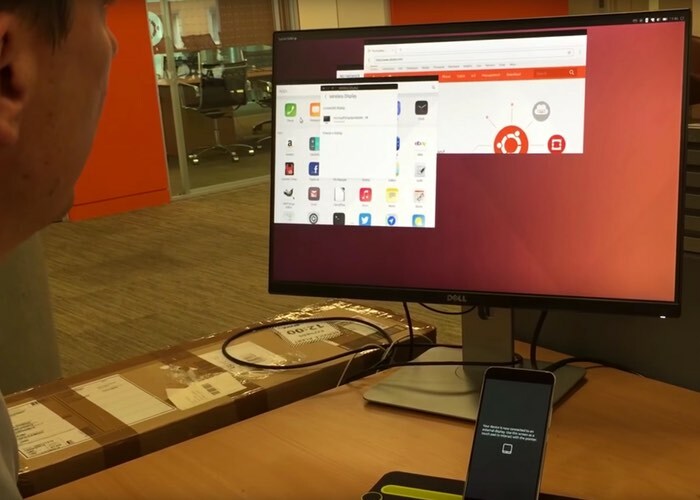 Now that the mobile version of Ubuntu supports wireless displays though, you don’t need a video port anymore. Just use a Miracast wireless display dongle to connect the phone to a monitor, connect a Bluetooth keyboard and mouse, and you’re good to go. When convergence is in use, the phone basically becomes the brains of a desktop computer, capable of running any Ubuntu software that’s been compiled for ARM-based processors. For more information on the new OTA-11 for Ubuntu update jump over to the Ubuntu website for details via the link below.